Six weeks ago, I added a new thread to my blog to give voice to the rich lore resulting from my parents’ 36 years as Vermont innkeepers. There’s only 62 weeks until their expected retirement, so it’s time to get cracking on documenting these stories. First, I want to explain my process. I rely on a combination of my own memories growing up in the inn and recollections of my mother’s re-telling of events to come up with the subject for each post. Then, I interview my parents, usually over dinner, to fact check my memory, gain more context, and add dimension to each story. At last Sunday’s dinner, a few questions about serving dinner at the inn yielded so much material that this post only includes stories from the first year. Undeterred, Dad made a few more calls and came up with a plan. He jumped in his Blazer with the turkey and headed down to our friend Jerry’s restaurant, the Winchester. Jerry had cranked up his stove to 500 degrees and proceeded to cook our turkey for the hour that it took my father to drive to and from Chester, where he picked up a hand-held drum of propane, something he wasn’t even sure was legal. In spite of the drama, Mom swears it was the best tasting turkey they’ve ever served. Salt and pepper rubbed inside. Place in turkey roasting pan with an inch of water. Cook at 500 degrees for one hour. What happened that New Year’s Eve is a story I remember like it was yesterday. We had a large group of 5 or 6 Japanese families who stayed at our inn, while they were skiing at Okemo Mountain. My Mom, Dad, and Aunt Nancy put together this impressive menu: roast beef, twice baked potatoes, Yorkshire pudding, glazed carrots, home-baked bread, and chocolate mousse. When Dad took the beef out of the oven to get drippings to make the Yorkshire pudding, there were no drippings and the beef looked like a huge leather shoe. That’s when he discovered that he had bought a pre-cooked roast beef (usually used to slice off luncheon meat) and not a raw beef slab. Lacking other alternatives, they reluctantly served the beef, carrots, bread and potatoes, without the Yorkshire pudding. The guests were so polite that nearly every one of them asked for seconds. I am the only member of my family who entertains the possibility that our Japanese guests actually liked the beef. 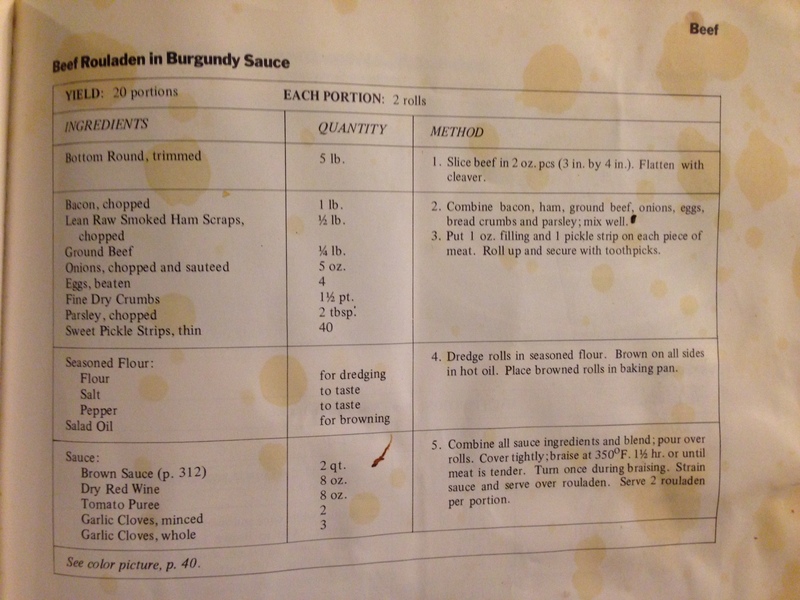 Drippings from Roast Beef (fat only) 24 oz. Break eggs in mixing bowl; beat well. Add milk; mix well. Add flour and salt; beat until smooth. Beat in melted butter. Place 12 oz. drippings in each of 2 15- x 18-in baking pans. Place pans on range and when smoking hot, divide batter evenly between pans. Place pans in 375 degree oven on shelf in bottom half. Do not open door for 25 minutes; total cooking time, 35-40 min. Remove from oven and drain excess fat by tipping pan. Cut in squares to serve, 25 portions per pan. The following summer, my parents and Aunt Nancy decided to serve dinners to the general public, in order to generate cash flow to help keep the business going through the slower summer season. I should explain that the Combes Family Inn has always had one seating each night for dinner (7pm Thursday through Saturday and 5pm Sunday) and serves the same three course meal to each guest, unless there is a prearranged special request. The menu changes nightly. 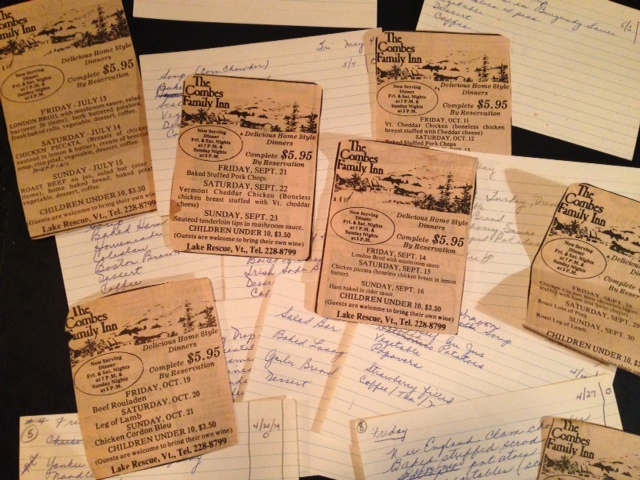 The innkeepers promoted their new dinner service throughout 1979 and 1980 with ads in the local weekly paper which included the dinner menu for the three course meal planned for that Thursday, Friday, and Saturday night, as well as a Sunday buffet. Each night, the meal was $5.95 complete with dessert and coffee. BYOB. 5 lbs regular Macintosh apples. 1/4 c. water, apple cider, or apple juice. Slice apples. Do not peel or remove cores. Put apples, sugar, and liquid in large covered pot and cook over medium flame for about 1/2 hour or until apples are tender. Put apple mixture through food mill (this is a great kitchen gadget, especially for pureeing soups and vegetables). Add lemon juice and cinnamon. It may not seem like it based on the stories I’ve told above. However, my parents are both excellent cooks. And, needless-to-say, dining at the Combes Family Inn is a truly one of a kind experience. I can vouch for both of them as good cooks–I’m often a happy guest in their dining room! “Dinner is going to be a few more minutes” – Love it! I must saay this blog loads a lott faster then most. It’s WordPress. They host it. I paid a very low price as an annual fee on the lowest tier blog they offer.